A truly unique diamond ring, our Three Stone Princess Cut Diamond Ring is reminiscent of the Victorian age, yet has a beautiful, modern flair. 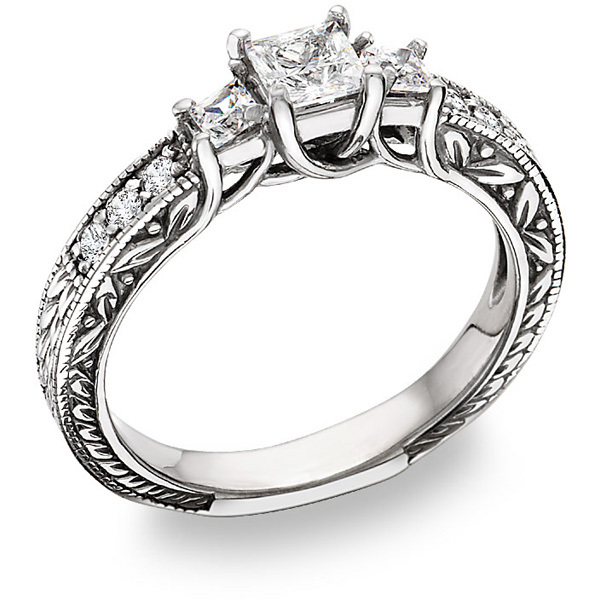 Three Princess Cut Stones with six round side stones set in 14k solid white gold. Three stones weigh a total of over 1 Carat total diamond weight in H Color, SI1-SI2 Clarity (1.16 Carats total). Available in 1/2 Carat or 1 Carat. Apples of Gold Jewelry guarantees the 1 Carat Three Stone Princess Cut "Floret" Diamond Ring to be of high quality and an authentic engagement ring with real diamonds, as described above.